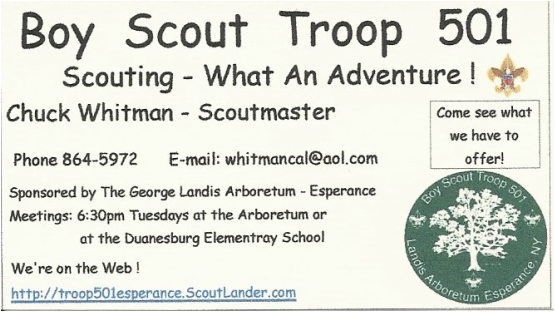 The Arboretum is pleased to sponsor Boy Scout Troop 501 under the very capable leadership of Scout Master Chuck Whitman of Mariaville. Troop 501 has been invaluable to the Arboretum, especially through volunteer efforts at our Spring/Fall Plant Sales. The Troop offers its members guided and responsible fun and adventure; trains them in citizenship, service, and leadership; engenders self-reliance; and promotes the maturing of youth prepared to participate in society. These attributes complement the Arboretum’s own educational endeavors, and the scouts make quality use of the Arboretum’s grounds. No doubt Fred Lape would be proud that his Oak Nose Farm is the site of such high ideals, noble goals, and community-minded action. © 2013- 2015, The Landis Arboretum. All Rights Reserved. Shop on Amazon Smile and Amazon will make a donation to Landis! Landis is an approved recipient of the State Employees Federated Appeal. ﻿Click﻿ for more information. Landis is a member of the Reciprocal Admissions program of American Horticultural Association. Click for more information.